"Why are we stopping here, we're like two blocks from the house?" "I just need a few minutes first." "Seriously? When are you going to get past your issues with your mother?" "You only see her a day or two at a time, you don't know." "Oh, I know, everyone has issues with their parents." "When I see her it just..."
"It brings back all the old feelings. Believe it or not, I wasn't always the masterpiece before you." "I have absolutely no problem believing that." "You know, your mother isn't the same person either. Everyone says so." "I do. We get on very nicely." "Yeah well, what's good for the goose isn't always good for the gander." Love overheard conversation. Also, cool new header. Didn't realize ducks had so many issues. Haha. Now is "goose" a derogatory term for ducks? I should bring them fresh bread instead of the stale stuff... Maybe it would help a bit. What could be worse than duck angst? That duck is all ducked up! That duck better hurry up. Its mother might have already flown south for the winter. Or, wait, do ducks fly south? Don't all ducks talk with a lisp? I had no idea the little quackers had so much going on! Cute. Poor duck. I always thought Mother Goose was contentious. Too funny...the accompanying photo is a perfect lead-in! I bet that saying was from a duck. Those ducks always come up with wacky sayings. Oh boy did you ever take the long way round to get to that punchline. You and your duck jokes. Funny. I love this! 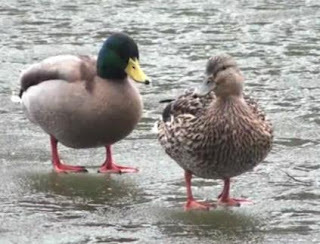 I once saw a pair of mallards land in our fish pond on Valentine's day years ago and I thought it was so romantic. But after reading this, they were probably lost on the way to some family reunion because the husband refused to look at a map. You crack me up.